This was intolerable. Now this also happens all over the country every day. Over 800,000 dogs, including puppies who cannot be cared for, are euthanized every year. And while that problem is half of what it used to be, and groups like the Humane Society and Best Friends have programs to address this, many areas of the country have no way to deal with animal over-population. Well, see in the above I started networking with everyone on the thread. 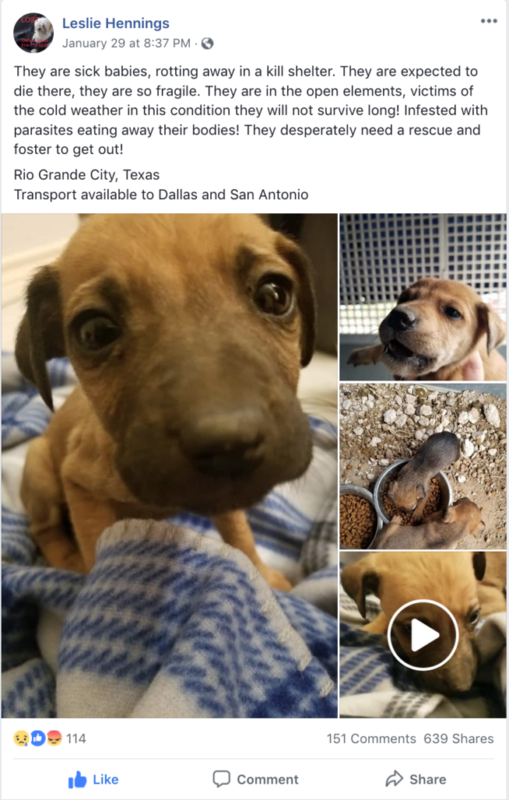 I found one foster who would take two of the puppies, and another contacted me online. Someone had already volunteered to be a short term foster and so I told them “Get them out!” One of the five puppies was very ill and I wanted them all to go to the vet. The next day Susan, the foster (who along with her husband own a comic book and game store!) sent her son to get the dogs and take them to the vet. Sadly, the sick pup passed during the night. We were down to four. I contacted a rescue I knew, and asked them to step in. I was set through the medium term foster families. I was paying for the vet because we couldn’t afford to wait to collect pledges. 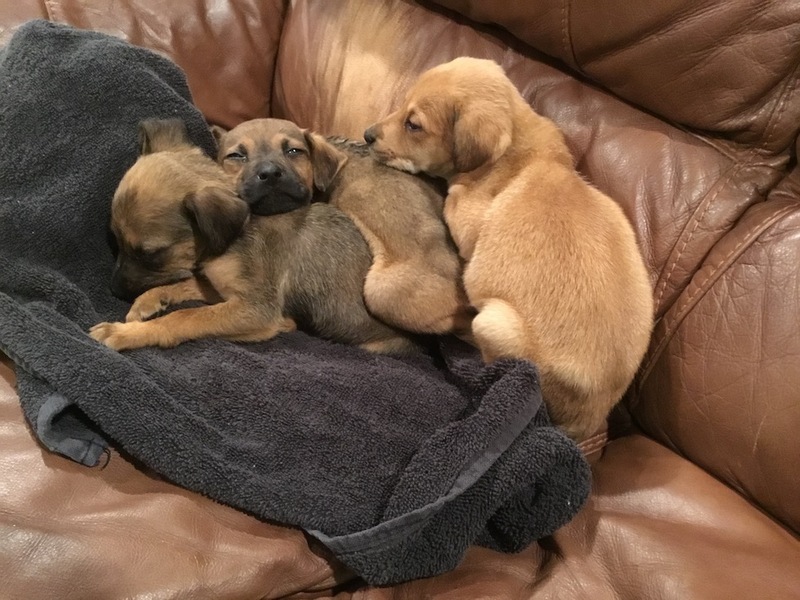 The rescue wasn’t crazy about the situation, but I refused to let these puppies go. Fortunately they found a rescue in Massachusetts where dogs are in demand and they agreed to step in. That night, one of the dogs, Latte, was not doing well, and so Susan rushed him to the ER Vet and she was identified with Parvo. That is a deadly disease that usually is a death sentence unless the dog gets great care and a little luck. Even then, young puppies don’t have the immune system to battle the disease. Susan called me and told me it would be $1,100 and I said fine. I didn’t hesitate. They were my responsibility now. Over the next day, Caramel got sick, but Mocha and Cocoa were doing well. Lesson learned, at this point they all should have been assumed to have parvo since they were a litter and were rolling around together. The vet didn’t warn us and another vet said don’t worry about the ones who were running around. Mistake. Next time, start treatment on all of them when one gets it. What is treatment? Well, luckily, Axanar Comics’ Trey McElwain is a Vet Tech and briefed us. Fluids, antibiotics, anti-nausea medicine and more. But fluids are critical as the dogs get diarrhea and that will dehydrate and kill them. The odds are against these three, but Susan won’t give up and because of it, I won’t either. Sadly, Saturday night Latte passed. She just couldn’t handle the stress of the disease. We were all broken up. But we have three more that need us, and now we have to focus on them. Susan is doing everything she can. So we are raising money for these puppies. And you can help, by following our YouTube shows and buying some cool stuff for which we give 100% to the puppies care. We will keep everyone posted on the puppies health.